Gov. Rick Perry would defeat Attorney General Greg Abbott by a nearly 3-to-1 margin if a Republican gubernatorial primary were held today, according to the latest University of Texas/Texas Tribune Poll. Such a contest might never come: Neither man has declared for that 2014 race, with each saying he will wait until June or later to make a public announcement of his political plans. Perry recently said they have talked and that Abbott wouldn’t run if the governor sought re-election. But just as the 2010 election year was preceded by speculation of a contest between Perry and Kay Bailey Hutchison, will-they-or-won’t-they talk about Perry and Abbott has become an unavoidable subject in the state’s political parlors. Among all voters, Perry would get 27 percent to Abbott’s 14 percent, with another 28 percent saying they haven’t thought about it enough to have an opinion and the rest saying they don’t vote in Republican primaries. Among respondents who identified themselves as Republicans, Perry got 49 percent to Abbott’s 17 percent, with 31 percent saying they have no opinion. “There’s a little bit of good news for everybody here,” said Daron Shaw, co-director of the UT/TT Poll and a government professor at the University of Texas at Austin. “For an incumbent who has been in office for a long time and who is coming off a really problematic run for president, these numbers are pretty good. A contest between the governor and the attorney general would probably start with a race between the candidates to describe Abbott to the voters who don’t know him. Perry, meanwhile, could be forced to fend off a challenge of the kind he used to sink Hutchison and that Ted Cruz used to sink David Dewhurst in last year’s GOP primary for U.S. Senate — challenges based in part on long service in government and legislative records not shared by Cruz and Perry, the ultimate winners in those contests. Still, Perry has been in the top job for a dozen years, and some indicators of his political health are strong. More details here, and the full poll results are here. 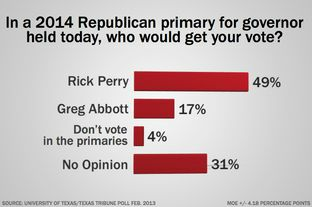 You may notice that the very first question they ask is “If Rick Perry were to run for governor again in 2014, would you vote for him, would you vote against him, or would you need to wait and see who is running against him?”, and only 26% say they would vote for Perry, with 36% saying “vote against” and 33% saying “wait and see”. I wouldn’t make anything of that for primary purposes, since the respondents to that question include all of the Democrats in this sample. They didn’t include any test matchups for November in their poll, so go back and review that PPP poll if you want to play the speculation game. Beyond all that, I just have a hard time believing Rick Perry is going to walk away and hand off the power he’s hoarded over the years without a fight. I don’t claim any special insight, and I’m well aware of the chatter about Perry and Abbott. I’m just saying that my own personal read of Rick Perry’s character is that he’s not the type to gracefully step aside. If he does, I feel confident that he’ll be getting something tangible out of it. One could argue that if he really is thinking about another run for President, he needs to run for Governor again to prove that he still has it with Republican primary voters after his disastrous 2012 campaign. But that only does him good if he wins, and there’s no guarantee of that. He’ll let us know what he plans to do when he’s damn good and ready, and until then we’ll just have to wait. Burka has more.